Food and Femininity. Kate Cairns and Josée Johnston. Bloomsbury. 2015. 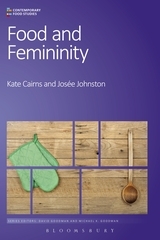 Food and Femininity, authored by Kate Cairns, Assistant Professor of Childhood Studies at Rutgers-Camden University, USA, and Josée Johnston, Associate Professor of Sociology at the University of Toronto, Canada, aims to give ‘scholarly treatment’ to a subject that affects the lives of many women on almost a daily basis: their relationship to food. The volume is comprised of eight principal chapters, and topics include a discussion of the conceptual toolkits used to construct an appropriate methodological approach; food and maternity; the politics of food; diets; and an exploration of whether cooking can be considered a feminist act. Food and Femininity employs qualitative research methods to uncover how different groups of women (and a number of men) navigate the multiple aspects of foodwork, with their findings drawn primarily from a sample of 100 food-orientated consumers from different backgrounds. The authors comment that the participants in the study were a fairly diverse group, but were united by a shared passion for food. The entire sample comprised 129 individuals altogether. There were 89 focus group participants (69 women and 20 men), and 40 in-depth interviews with women, 11 of whom were already prominent food activists in the Toronto area. Of the total sample, 31 were people of colour, and 98 were white; 79 were upper- or middle-class, and 50 were working class. Meetings were held in participants’ homes, when appropriate, to foster a sense of intimacy and community. In their introductory chapter, ‘A Personal Food Prologue’, the authors discuss how the interest of the book lies not just in women per se, but in the notion of femininity itself. Femininity is defined in this case as the range of ideas about ‘how to be and act feminine’, thus signalling an inherently gendered identity. Our first question must be this: what does it mean to be feminine? Femininity as a notion refers to the socially constructed roles and behaviours that society at large considers appropriate for women to perform: in this case, it would be that women are supposed to be good at, and enjoy, foodwork. However, as the authors rightly point out, the choices that women make regarding food tend to be ‘closely examined under the social microscope, and [women] are harshly judged when they are deemed inadequate or ill-informed’. Thus, women are perceived as having not lived up to their given gender role, and are therefore ‘failures’ at performing femininity. Feminism, then, as the authors discuss in ‘Thinking Through Food and Femininity: A Conceptual Toolkit’, can help us to detangle issues surrounding women, foodwork and the construction of femininity through the use of a ‘theoretical toolkit’; a concept made famous by French philosopher Michel Foucault. The authors follow food sociologist Michael Carolan’s emphasis on ‘lived experience’: namely, that a person’s individual experiences should take centre stage in discussions or research regarding foodwork. This is not a concept unique to sociology, however; the idea that the ‘personal is political’ is the mainstay of feminist activism and theory. The authors use three conceptual toolkits to unpack the issue of food and the construction of femininity: the first explores the concepts employed for theorising food and femininity (i.e. feminism, femininity and so on); the second toolkit engages primarily in theorising the emotional dimension to food and femininity in ‘neo-liberal times’; and the third conceptualises femininity ‘in relation to food’s dual role as a source of social status and a catalyst for social change’. These toolkits, then, help the authors to analyse how femininities are constructed and contested through contemporaneous food practices such as food shopping, cooking, eating and so on; thus, they are ‘doing’ gender as a social practice. As the authors note correctly, many women disliked cooking before feminism took the stage. But the advantage of using a feminist methodology is that it offers us a ‘language to critique inequitable domestic expectations’. The emergence of the oft-maligned Second Wave movement during the 1960s and 1970s did not encourage women to throw off their aprons and abandon their love of foodwork altogether, but it empowered women to question dominant expectations surrounding the gendered imbalance of the maintenance of domestic tasks, alongside the assumption that they should work outside the home, raise a family and so forth. Women do not all react to foodwork in the same uniform manner. Food and Femininity therefore offers a useful exploration of food and the construction of femininities, and demonstrates how food itself can be used as a means by which social inequalities can be uncovered. Katherine Williams graduated from Swansea University in 2011 with a BA in German and Politics. She is currently writing her MA dissertation on the motivations of women involved in ethno-national liberation movements. Her academic interests include feminist methodologies and political theory, memory and reconciliation politics, and gender in IR. You can follow her on Twitter: @polygluttony. Read more reviews by Katherine Williams.